With an Americana sound that varies from alt-country to rock n’ roll to indie rock, Madison-based band Blueheels sound perfectly modern and vintage at the same time. The band has two recordings under their belt (2006’s Long Gone and Lessons in Sunday Driving released in April of 2008), a live album soon to come, and a third studio record in the works. They seem to be keeping themselves busy creatively, while also keeping a regular and extensive performing schedule. 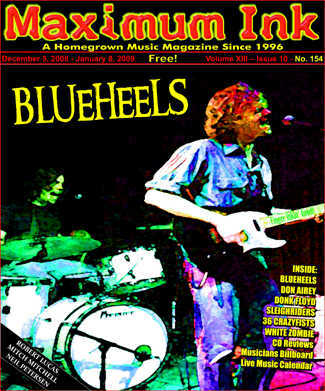 Blueheels formed in the early summer of 2005 in Neenah, WI by Robby Schiller and Justin Bricco; two friends that had connected through the Fox Valley live music scene. Robby (lead vocals/rhythm guitar) and Justin (lead guitar) immediately recruited Tim Schweiger (Tim Schweiger and the Middlemen/Yesterday’s Kids/Obsoletes) on drums, Brett Jannusch on bass guitar, and Rebecca Krafft on harmony vocals to round out the lineup. Blueheels spent the next year or so writing material for their debut album and gigging semi-frequently. As the band became more and more serious over the next few years, the lineup changed three times before finally settling on the current cast. During these changes the band relocated to Madison. The first change included the addition of Adam Cargin on drums in April of 2006, the second saw the addition of Justin Perkins (Yesterdays Kids/The Obsoletes) on bass in early 2007 as Brett and Rebecca left the band to pursue other life endeavors, and the third, in January 2008 saw the addition of Landon Arkens on bass and Teddy Pedriana (Blake Thomas and the Downtown Brown) on keys.